That's a great question! I know everyone probably expects me to say, "Yes, chocolate only," but I'm definitely NOT that restrictive when it comes to my sweet tooth. Are you? So, the simple answer is - any dessert will do for this dessert cookbook! 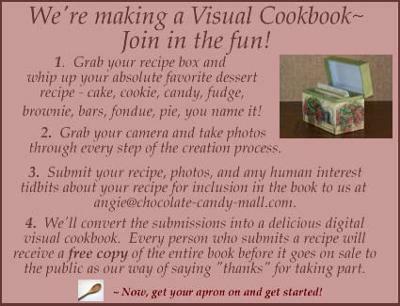 As long as you love it and can illustrate your recipe with photos, we want to see it and add it to the visual cookbook. Thanks for asking. I should have made that a little bit more clear. Maybe I'll have to redo the instructions a teensy bit.